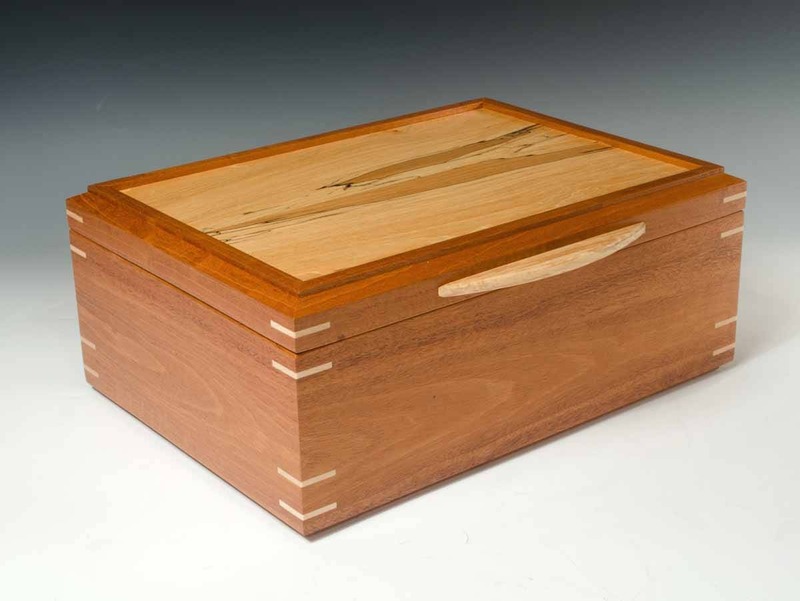 This jewelry box is made of genuine Mahogany which in turn highlights the Spalted Maple lid. 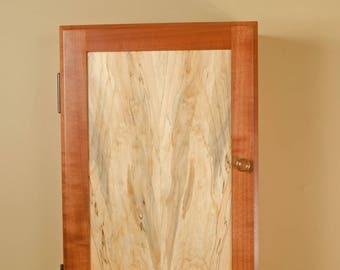 The corner accent pieces, (which also add significant strength to the construction, are Maple. The lid handle is Spalted Beech. Inside are two, half-wide sliding trays that also lift out. One of the trays includes a ring bar. Below the trays is a full width, removable divider grid. The hinges are US made, solid milled brass with built-in stops to hold the lid open. The lining material is a heavy-duty faux suede upholstery fabric that is rich yet very durable. The entire piece is finished in multiple coats of satin lacquer. Approximate overall dimensions are 13" wide, x 10" front to back and 5 3/4" high. Good on in stock items only, no customization or custom orders. Current free standard domestic ground shipping offer still applies. This keepsake box is INCREDIBLE!!!! The workmanship is stunning. Every aspect of it is perfect. A handmade piece of the greatest quality. The tiger maple is one of my favorites. It is a gift for my husband and he adores it. The contrasting colors are beautiful. I am so happy with this purchase and can highly recommend this to all. Gorgeous piece, shipped fast and well packed. Very pleased with the purchase. Love this box. Looks even better than the pics. Seller was very patient and responsive with my questions. Beautifully constructed, first class finish. My husband loved it. I will refund in the event of damage on arrival. I require that the piece be returned to my, and will provide a FedEx return authorization to facilitate this. Should you decide the piece you purchased does not meet your needs, I will be happy to exchange it for another piece, either currently in inventory, or custom. My normal shipping method is FedEx ground. Posted shipping costs are for FedEx domestic, ground only. Shipments to Alaska, Hawaii, and the territories, as well as expedited shipping will require additional cost. Please inquire for a firm quote. I do not ship outside of the U.S. at this time. Note: a phone number is required by FedEx. They use that should a signature be required or there are delivery issues. Please include yours if possible in the buyer comments when purchasing. Otherwise I end up putting my number in and that is not too helpful to you if there is a delivery problem.